BHT-600 is a bulk pack of our HT-600 Hot Tips for Satellite City 1,2 and 4oz CA glue bottles. Each unit of BHT-600 is a package of 100 20mm spouts and overcaps. This item is a 100-pack; if you just want a few spouts, choose our HT-600 2/Box Replacement Spouts and Overcaps for 1,2, and 4oz bottles of CA Glue. Please note we sell only up to 10 of these per order. 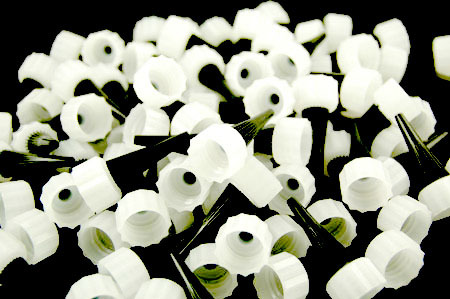 If you want to buy more than 1,000 spout/cap assemblies (10 units of BHT-600), please order in our bulk cases of 2,000. These spouts fit our 1, 2, and 4oz bottles.